Ilcsi Organics Rose Petal Gel Mask | £39.95 // I haven't heard of this brand or product before so I'm excited to test it out. Out of the three masks on offer I'm glad I got the rose version as it seems like the one most suited to my skin type although any of them would have worked. Targeted to keep skin hydrated, this once a week mask says it will also help to shrink pores and brighten your skin. It looks like there's only one or two uses in the small pot but it sounds intriguing. Electric Hair Hydrate Shampoo | £17.50 // I haven't heard of this brand before but I'm always interested in trying new shampoos especially those that are meant to be hydrating. Miracle Skin Transformer Hydro-Active Microderm | £25 // Winter is the only time I really use a manual exfoliator, throughout the rest of the year I find a muslin cloth or flannel along with an acid toner is all I need, so this mini tube has come in quite handy. I am usually able to get by with only using these sample sizes and haven't to buy a full size exfoliator for a while. This one from MST feels very gentle on the skin which is perfect for my sensitive skin. It feels like it's polishing the skin rather than scratching away the dead skin. Models Own Velvet Goth in Absinthe | £5 // We were able to pick out our own nail polish and although my first choice was already sold out I went for my second, Absinthe, a dark green shade. Without a top coat you get a rough looking matte finish to the nail polish but add a top coat and the glitter really comes to life. I'll be sharing a NOTD of this at some point. Benefit Christmas Cracker - High Beam | £19.50 // I already have the full size of this which I've had for about four years or more so it's probably about time I throw it away. This mini tube is the perfect replacement! This is a pink toned highlight which you can apply underneath or over foundation or even mix it into your foundation to create a dewy glow. 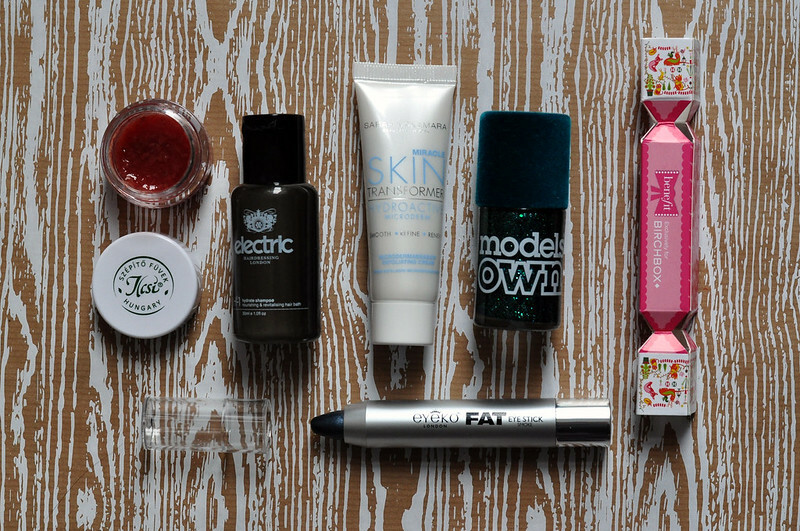 Eyeko Fat Eye Stick in Smoke | £8 // I haven't tried any Eyeko products since the big re-brand a few years ago. Smoke is a dark grey almost black with very thin blue shimmer. Unlike other products like this, you actually get a lot of product for £8 and there is no need for a sharpener either which is always a bonus. This Fat Eye Stick can be used as an eyeshadow base all over the lid and blended out or as a liner smudged into the lash line. Sophia Webster Purse | £25 // This is a cute mini purse that looks perfect for a night out when you're using a tiny clutch or to keep emergency bobbles and clips in your handbag. That Benefit cracker is so cute! The Eyeko eye stick looks interesting too. I think I'm going to subscribe for a few months in January, as the boxes are adorable and I love boxes for keeping all my bits and bobs in. Ahh this box looks amazing! 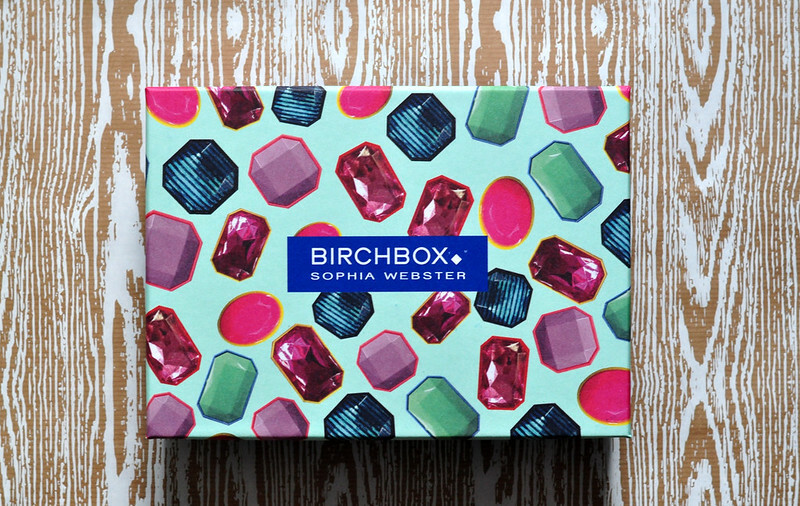 Birchbox just came to Canada and I cannot wait to see whats to come from the brand. Have fun using our product and please share your experience with us, customerservice@ilcsi-natural-cosmetics.co.uk.